The size is perfect and the quality is great for the price. The sizes are a bit rounded which I wish I would have known but it worked out fine for the placement. This Desdemona mid-century loveseat by Christopher Knight Home is a great addition for any home. Featuring both comfort and style, the contemporary 2 seater sofa is perfect for a home office or living room. The slightly curved back of the settee helps provide extra comfort and also gives the settee a softer look. This settee is great on its own or with other furniture. 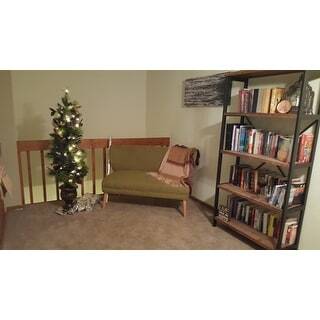 I bought this couch for my loft just as something cute and stylish next to a bookshelf. 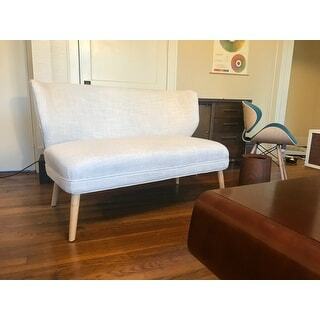 It fits perfectly and most couches this price aren't very comfortable but this one is! Took two minutes to add the legs and it was ready to go. I am Absolutely Satisfied with this product - I know I purchased it during a sale it likely was *** or maybe a tad under because of some reward points but I do feel I got so much bang for my buck especially compared to other furniture I see in friends homes that they cant buy new without knowing the secret of Overstock and that its actually very decent quality and more comfortable than my main "Couch" really a futon thats temperpedic memory foam stuffed. In the small area i reside in now I found this to be the exact size needed to make an awkward passage way into a reading nook and Its still a work in progress But i have a beautiful pendant light installed in the area and have nearly finished repainting the thin stand to go beside it to hold my things. I mention this as I want to take a picture of it where it is now for this review but its so messy and in transition still I dont think it will do any good. 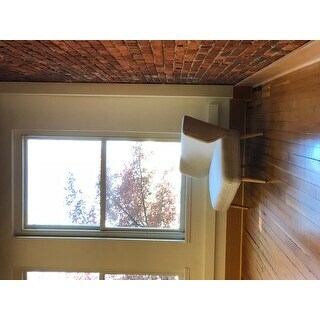 However My unit was Beige and I know a customer photo of the beige option is badly needed as I was discouraged by their up-close photos of the beige that made it look cheap or that I wouldn't be happy with it. Though I love the main photo they display of it in that lighting, I will say in person it appears much more like that then the upclose photos of the beige fabric Overstock took that had me worry but I knewI couldn't have a colred option for my location.. I think I will pick it up (its sturdy and easy to move) and take a picture of it somewhere more clean where you can still see it. I wish my actual place for it was complete. Maybe I can edit this in the future when it is. However I want to badly get real life customer photos out there for the beige option as at least when I ordered no one had any and I was hesitant. I didnt need to be. It does look much more white (As I like for my theme here) under correct lighting but even the beige up close looks fine in person - I dont think my photos do it justice either Some things you maybe just need to see in person. I at least can attest to the fact that if you like the beige appearance in their main photo with it dead on under the painting etc - and you want it over colored options but arent certain - just go for it its not something you will regret. Assembly is the most easy thing I have ever put together - slide in 4 legs into slots and secure with bolts. = Done and then the bottom has a zipper pouch to close back up access to the bottom neatly. I Moved it into the living room to get a cleaner set of photos for you guys. Hope this helps someone else in choosing their color option. 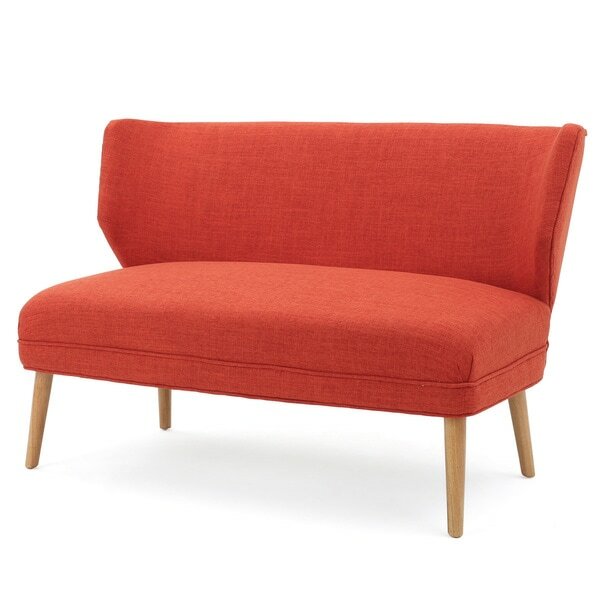 I purchased this settee in orange and it's beautiful. The linen like fabric is quite lovely. Perfect piece for my mid-century modern living room. I needed a small settee for my home office. It was very easy to assemble and is very sturdy and cute. Perfect for what I needed. 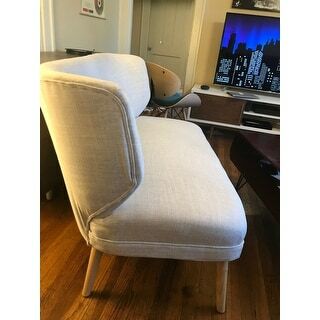 Bought this to go with the Desdemona mid-century accent chair. Perfect for small area. Comfortable and firm seat. Comfortable Slightly curved and contoured back. Tapered legs for stability and durability. Natural wood stain goes well with all colors. Orange and blue ones are well liked with my clients. Exactly as shown! 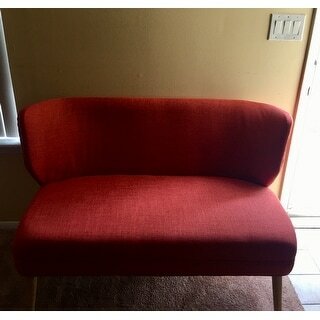 Loveseat is just what I was looking for, great price, great color, perfect size. It looks just like the picture, added a couple of decorative pillows and it looks perfect. Really nice looking, high quality material, sturdy (except my boyfriend is heavy and kind of rough and I worry about him breaking it if he’s not gentle), surprisingly comfortable, although a little challenging to screw in all the legs blindly. You have to line up the holes and it’s not always very easy. I bought it for a high traffic area in my office and I’m glad I made this choice. Goes great with the matching chairs. 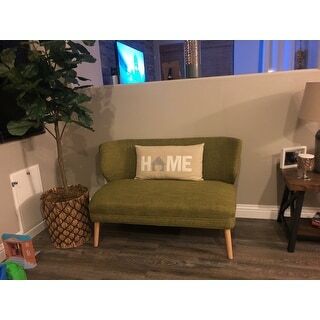 Comfortable, loved the fabric, perfect for my small living room. I was expecting to use this as a dining table bench, but it is really more like a small sofa; too deep for a table. The fabric is very tight on the top corners of the back and it seems like they may wear quickly. I love this couch , I was looking for a long time to buy something small and different for the entrance of my house and this is perfect . I got the green color which goes with my industrial style living room . I would definitely recommend this item to everyone looking for a little space to fill out . Thank you Overstock ! Great quality, should have went with a different color, doesn’t clean well. Style is awesome though. Easy to assemble with two people. The seat portion is excellent, firm and comfortable. The back portion is a bit deep and hard, so plan on adding at least two pillows. The lumber beneath is made of SUPER cheap materials, but it works. I gave this loveseat four stars. We are happy with it and hopefully it will last. Love this little couch! It’s a great size for a small room. This sette is sturdy, simple, modern and reasonably priced. Just what I was looking for. I also bought the matching burnt orange dining chairs. Nice chair. Was very easy to assemble, just had to screw on the legs. The upholstery is good quality and construction is solid. Loveseat arrived with legs tucked inside to be assembled, which was fine, instructions were easy and proper tool included to assemble however when I unwrapped one of the legs it was covered in mold. I emailed the company and they promptly sent a new leg. 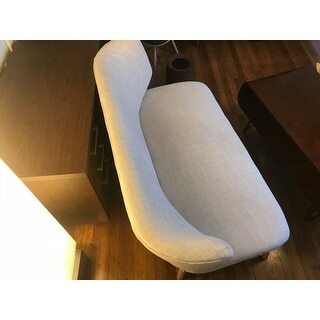 Love the design and size and fabric of this loveseat - fits perfectly where I put it and it is comfortable. Beautiful piece. We painted the legs a dark mahogany to create more contrast, and it still looks amazing two years later. Love it! I really love the look, color and size of this mid-century modern couch. It was exactly what I was looking for to go in my sunroom. There was just one thing that bothered me about it...the appearance of the fabric on the top part of the couch was lose and wavy, so I called customer service (who is always top notch) and they suggested steaming the fabric. I took their suggestion, steamed the couch and it really helped a lot. So other than that, everything else about this couch is great! It’s very comfortable and you can easily fit 2 people and 3 if you had to. The green color is fantastic. It is a cheaper quality but it works for what we need it for.... We've had it for almost a year now and it still looks brand new. Awesome quality! Very comfortable! Totally impressed!!! Such a steal of a deal! I bought the green one. We love it! I certainly recommend this product! I could use another one in my office. "I am interested in buying this orange loveseat and also a pair of muted orange dining chairs. Will they be the same color?" "I saw the below question/answer: How is a loveseat considered "single seating"? Obviously it's intended for two people. Hence the name! "What's the weight capacity of this loveseat?" A: We don't have a set weight capacity. However, we don't recommend anything heavier than 250 lbs for our single seating items. Overstock Sep 11, 2018"
"What's the weight capacity of this loveseat?" "Is the "beige" really more of an ivory color, as pictured?" "how deep is the seat? Is the seat cushion removable/reversible?" 21.5 inches deep and the cushion is not reversible. I'm a Realtor and have been offering free staging for some of the properties I list. Staged homes typically sell more quickly and for more money. This loveseat will fit perfectly in many of the properties I'm marketing. Super excited to receive it. I think my clients will love it too! Simple, but classy and elegant! "How much weight can the couch hold"